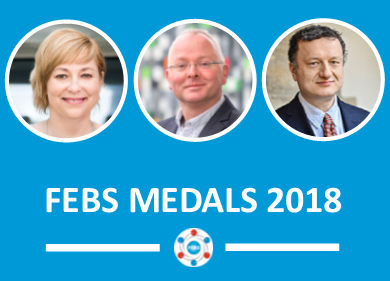 FEBS awards three medals for outstanding achievements in Biochemistry and Molecular Biology or related sciences to distinguished senior scientists: the Theodor Bücher medal, the Sir Hans Krebs medal, and the Datta medal. The 2018 awardees – Agnieszka Chacinska, Albert J.R. Heck and Jan Konvalinka, respectively – will be presented with their medals and deliver plenary lectures at the 43rd FEBS Congress in Prague. They are now featured in posts on the FEBS Network, where they share something of their research highlights, motivations and approaches.